Your quizmaster, enjoying the sunshine. To submit your response, e-mail us at kmishell@intothelightradio.org. NEW PRIZE! 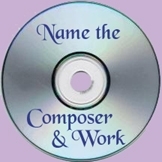 The first person to respond with the correct composer will win an Orchestral Sampler CD from Women's Philharmonic Advocacy (www.wophil.org). The first person to name both the correct composer and the name of the piece will win a penlight as well as the Orchestral Sampler CD. The name(s) of the winner(s) will be posted here, unless you prefer to remain anonymous. New quiz excerpts are posted on the first of each month. TECHNICAL NOTE: If you're visiting this page on the 1st and the new quiz doesn't appear to have been posted, please refresh the page in your browser! On most browsers, this is a curved arrow(s) among the tools at the top of the browser window. You may even have to do a "hard refresh." To do this on a Mac, hold down the "shift" key and click the refresh arrow; on a Windows PC, hold down the "ctrl" key and press F5. WINNER OF OUR MARCH QUIZ! 3/01/19: Eric Ruijssenaars of Leiden, The Netherlands, was the first to correctly identify the work, Liza Lehman's Henry King. Listen to the excerpt. My method is easy: I check the broadcast archives. Why do I bother? The answer is that I learn about a lot of music as I search. 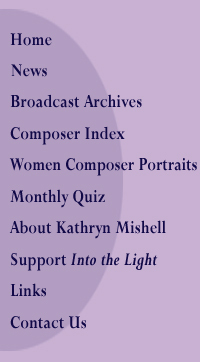 Although over the years I have heard music by most historical women composers, especially when I was teaching women's history in music, the quiz excerpts are often pieces I don't recognize, let alone know well. When I taught music history, most of our exams for graduate students included writing about "unknowns," that is, excerpts from larger pieces, as in these quizzes. Students were to describe what stylistic features they found significant as educated listeners. They weren't asked simply to name the composer and piece. In fact they usually had more to say if they didn't recognize exactly what piece it was. The "Into the Light" January 2017 piece was one I didn't know at all, although Barbara Pentland's name is very familiar. I listened to the excerpt and heard a wind ensemble, some kind of chamber ensemble (one player to a part) with brass as well as winds. I went through the broadcast index year by year with a find/search command for "wind' on each page. I started with 2010. Nothing. The 2009 broadcasts listed a 'wind' piece for flute and piano and one for a wind trio. Neither was big enough a group. The 2008 broadcasts included wind symphony works, mostly by Cindy McTee; they were too big. In 2007, my search term 'wind' took me to Barbara Pentland's wind octet. Hmm... Pentland sounded likely, I listened to the excerpt in the 2007 list. Eureka! 2/01/19: Karla Hartl of Toronto, Ontario, Canada was the first to correctly identify the work, Margaret Bonds' Troubled Water. Listen to the excerpt. 1/01/19: No one guessed the work, Alexina Louie's Cadenza for clarinet and percussion. Listen to the excerpt. 12/01/18: No one guessed the work, Francesca Caccini's La liberazione di Ruggiero. Listen to the excerpt. 11/01/18: No one guessed the work, Paule Maurice's Tableaux of Provence — Five Pieces for Saxophone and Orchestra. Listen to the excerpt. 10/01/18: No one guessed the work, Luise Adolpha Le Beau's Romance in E Major, Op. 24 No. 1. Listen to the excerpt. 9/01/18: No one guessed the work, Nadia Boulanger's Vers la Vie nouvell. Listen to the excerpt. 8/01/18: No one guessed the work, Alex Shapiro's Current Events. Listen to the excerpt. 7/01/18: No one guessed the work, Galina Ustvolskaya's Concerto for Piano, String Orchestra and Timpani. Listen to the excerpt. 6/01/18: No one guessed the work, Kathryn Mishell's Voyage of the Spirit. Listen to the excerpt. 5/01/18: No one guessed the work, Doreen Carwithen's Violin Sonata. Listen to the excerpt. 4/01/18: No one guessed the work, Marianne Martinez's In Exitu Israel. Listen to the excerpt. 3/01/18: No one guessed the work, Jennifer Hidgon's Soliloquy. Listen to the excerpt. 2/01/18: No one guessed the work, Florence Price's Mississippi River . Listen to the excerpt. 1/01/18: Karla Hartl of Toronto, Ontario, Canada was the first to correctly identify the work, Ester Mägi's Symphony No. 1. Listen to the excerpt. 12/01/17: No one guessed the work, Ellen Taaffe Zwilich's Concerto Grosso: to Handel's Sonata in D for Violin and Continuo. Listen to the excerpt. 11/01/17: Deborah Hayes of Boulder, Colorado was the first to correctly identify the work, Fanny Hensel's Sonata in E Major. Listen to the excerpt. 10/01/17: No one guessed the work, Augusta Read Thomas's Spirit Musings. Listen to the excerpt. 9/01/17: No one guessed the work, Judith Shatin's View from Mt. Nero. Listen to the excerpt. 8/01/17: No one guessed the work, Stacey Garrop's Thunderwalker. Listen to the excerpt. 7/01/17: Elizabeth R. Austin of Connecticut was the first to identify the composer; Pamela Marshall was the first to correctly identify both the composer and the piece, Chen Yi's Romance of Hsiao and Ch'in. Listen to the excerpt. 6/01/17: No one guessed the work, Barbara Strozzi's Aure Giá che Non Posso Dall'Idolo Mio. Listen to the excerpt. 5/01/17: Cecilia Montemayor was the first to correctly idenfity the work, Ruth Crawford Seeger's String Quartet. Listen to the excerpt. 4/01/17: No one guessed the work, Stella Sung's Orange Mango Tango. Listen to the excerpt. 3/01/17: No one guessed the work, Marie Grandval's Grande Sonate, Op. 8. Listen to the excerpt. 2/01/17: No one guessed the work, Deon Nielsen Price's Epitaphs for Fallen Heroes. Listen to the excerpt. 1/01/17: Deborah Hayes of Boulder, Colorado was the first to correctly identify the work, Barbara Pentland's Octet for Winds. Listen to the excerpt. 12/01/16: Deborah Hayes of Boulder, Colorado was the first to correctly identify the work, Minna Keal's String Quartet, Op. 1. Listen to the excerpt. 11/01/16: Linda Rimel was the first to correctly identify the work, Ethel Smyth's The March of the Women. Listen to the excerpt. 10/01/16: No one guessed the work, Maria Szymanowska's Nocturne in B-flat Major. Listen to the excerpt. 9/01/16: No one guessed the work, Katherine Hoover's Suite for Saxophones. Listen to the excerpt. 8/01/16: Karla Hartl of Toronto, Ontario, Canada was the first to correctly identify the work, Vítzslava Kaprálová's Burlesque, Op. 3b, for violin and piano. Listen to the excerpt. 7/01/16: Deborah Hayes of Boulder, Colorado was the first to correctly identify the work, Deborah Drattell's Fire Dances — Clarinet Concerto. Listen to the excerpt. 6/01/16: Pamela J. Marshall of Lexington, MA was the first to correctly identify the work, Cécile Chaminade's Trio No. 1 in G Minor, Op. 11. Listen to the excerpt. 5/01/16: Elizabeth Austin of Connecticut was the first to correctly identify the work, Anna Amalia, Duchess of Saxe-Weimar's Concerto for 12 Instruments and Cembalo Obbligato. Listen to the excerpt. 4/01/16: No one guessed the work, Mary Howe's Suite for Piano and String Quartet. Listen to the excerpt. 2/01/16: No one guessed the work, Fanny Mendelssohn Hensel's Overture. Listen to the excerpt. 1/01/16: No one guessed the work, Jean Coulthard's Concerto for Piano and Orchestra. Listen to the excerpt. 12/01/15: No one guessed the work, Rebecca Clarke's Dumka for Violin, Viola & Piano. Listen to the excerpt. 11/01/15: No one guessed the work, Louise Farrenc's Sextett for Flute, Oboe, Clarinet, Horn, Bassoon, and Piano. Listen to the excerpt. 10/01/15: No one guessed the work, Agathe Backer Grondahl's Ballade in B flat major, op. 36 No. 5. Listen to the excerpt. 9/01/15: No one guessed the work, Joelle Wallach's Shadow, Sighs and Songs of Longing. Listen to the excerpt. 8/01/15: Corentin Boissier of Paris, France, was the first to correctly identify the work, Sophie Carmen Eckhardt-Gramatté's Markantes Stück. Listen to the excerpt. 7/01/15: No one guesssed the work, Thea Musgrave's Summer from The Seasons. Listen to the excerpt. 6/01/15: No one guesssed the work, Vivian Fine's Alcestis. Listen to the excerpt. MAY 2015: Deborah Hayes of Boulder, Colorado was the first to correctly identify the work, Zara Levina's Concerto for Piano and Orchestra No. 2 in E Minor. Listen to the excerpt. APRIL 2015: Deborah Hayes of Boulder, Colorado was the first to correctly identify the work, Elisabeth Jacquet de la Guerre's Jonas. Listen to the excerpt. 3/01/15: Deborah Hayes of Boulder, Colorado was the first to correctly identify the work, Clarice Assad's Concerto in D Major for Violin and Orchestra. Listen to the excerpt. 2/01/15: Deborah Hayes of Boulder, Colorado was the first to correctly identify the work, Clara Schumann's Five Songs. Listen to the excerpt. 12/01/14-1/01/15: Deborah Hayes of Boulder, Colorado was the first to correctly identify the work, Alex Shapiro's Slipping. Listen to the excerpt. 11/01/14: Karla Hartl of Toronto, Ontario, Canada was the first to correctly identify the work, Violet Archer's Piano Concerto. Listen to the excerpt. 10/01/14: Deborah Hayes of Boulder, Colorado was the first to correctly identify the work, Anna Kaija Saariaho's Graal Théâtre. Listen to the excerpt. 9/01/14: Deborah Hayes of Boulder, Colorado was the first to correctly identify the work, Anna Bon di Venezia's Flute Sonata, op.1 No. IV. Listen to the excerpt. 8/01/14: No one guessed the work, Chen Yi's Shuo. Listen to the excerpt. 7/01/14: No one guessed the work, Elisabeth Jacquet de la Guerre's Sonata in A. Listen to the excerpt. 6/01/14: No one guessed the work, Lili Boulanger's D'un Soir Triste. Listen to the excerpt. 5/01/14: Deborah Hayes of Boulder, Colorado was the first to correctly identify the work, Jean Coulthard's Music on a Quiet Song. Listen to the excerpt. 4/01/14: Deborah Hayes of Boulder, Colorado was the first to correctly identify the work, Marian Bauer's Suite for String Orchestra. Listen to the excerpt. 3/01/14: No one guessed the work, Hilda Sehested's Suite for Cornet or Trumpet in B flat and Orchestra. Listen to the excerpt. 2/01/14: Deborah Hayes of Boulder, Colorado was the first to correctly identify the work, Sofia Gubaidulina's Piano Quintet. Listen to the excerpt. 1/01/14: Deborah Hayes of Boulder, Colorado was the first to correctly identify the work, Maria Szymanowska's Nocturne in B-flat Major. Listen to the excerpt. 12/01/13: No one guessed the work, Judith Shatin's Adonai Roi. Listen to the excerpt. 11/01/13: Deborah Hayes of Boulder, Colorado was the first to correctly identify the work, Pauline Oliveros's Nike. Listen to the excerpt. 10/01/13: Deborah Hayes of Boulder, Colorado was the first to correctly identify the work, Rebecca Clarke's Piano Trio. Listen to the excerpt. 9/01/13: No one guessed the work, Jennifer Higdon's Zaka. Listen to the excerpt. AUGUST 2013: Pam Blevins of Brevard, North Carolina, was the first to correctly identify the work, Amy Beach's Piano Concerto in C-Sharp Minor, Op. 4. Listen to the excerpt. JULY 2013: No one guessed the work, Louise Farrenc's Scherzo from Trio in E Minor, Op. 45 for flute, cello, and piano. Listen to the excerpt. JUNE 2013: No one guessed the work, Peggy Glanville-Hicks' Sinfonia Da Pacifica. Listen to the excerpt. MAY 2013: Elizabeth Austin of Connecticut was the first to correctly identify the composer, and Deborah Hayes of Boulder, Colorado, was the first to correctly identify the composer and the work, Louise Talma's Alleluia in Form of Toccata. Listen to the excerpt. APRIL 2013: Deborah Hayes of Boulder, Colorado was the first to correctly identify the work, Grazyna Bacewicz's Fifth Sonata for Violin and Piano. Listen to the excerpt. MARCH 2013: No one guessed the work, Francesca Caccini's Ecco Chi'io Verso Il Sangue (See How My Blood Flows). Listen to the excerpt. FEBRUARY 2013: Eliane Aberdam (of Rhode Island) and Dafina Zeqiri (of Prishtina, Kosovo) tied! Both simultaneously sent the first correct replies identifying the work, Cécile Chaminade's La Lune Paresseuse. Listen to the excerpt. JANUARY 2013: Deborah Hayes of Boulder, Colorado was the first to correctly identify the work, Maria Malibran's Rataplan. Listen to the excerpt. DECEMBER 2012: Karla Hartl of Ontario, Canada was the first to correctly identify the work, Germaine Tailleferre's Sonata for Violin and Piano No. 2. Listen to the excerpt. NOVEMBER 2012: Deborah Hayes of Boulder, Colorado was the first to correctly identify the work, Debbie Wiseman's Love Theme from Tom & Viv. Listen to the excerpt. OCTOBER 2012: Deborah Hayes of Boulder, Colorado was the first to correctly identify the work, Mary Howe's Castellana. Listen to the excerpt. SEPTEMBER 2012: No one guessed the work, Lili Boulanger's Faust et Hêlene. Listen to the excerpt. AUGUST 2012: Deborah Hayes of Boulder, Colorado was the first to correctly identify the work, Minna Keal's Symphony Op. 3. Listen to the excerpt. JULY 2012: Deborah Hayes of Boulder, Colorado was the first to correctly identify the work, Ethel Smyth's Serenade in D. Listen to the excerpt. JUNE 2012: Dr. Elizabeth Hinkle-Turner of Texas was the first to correctly identify the work, Maddalena Lombardini Sirmen's Quartet No. 2. Listen to the excerpt. MAY 2012: Karla Hartl of Toronto, Canada was the first to correctly identify the work, Maria Perucona's Gaude plaude. Listen to the excerpt. APRIL 2012: Deborah Hayes of Boulder, Colorado was the first to correctly identify the work, Ruth Loman's Bassoon Concerto. Listen to the excerpt. MARCH 2012: Dafina Zeqiri of Prishtina, Kosovo was the first to correctly identify the work, Fanny Hensel's "March" from Das Jahr. Listen to the excerpt. FEBRUARY 2012: Deborah Hayes of Boulder, Colorado was the first to correctly identify the work, Emma Lou Diemer's Suite of Homages. Listen to the excerpt. JANUARY 2012: Deborah Hayes of Boulder, Colorado was the first to correctly identify the work, Antonia Padoani Bembo's "Psalm CXXIX" from The Seven Psalms of David. Listen to the excerpt. DECEMBER 2011: Deborah Hayes of Boulder, Colorado was the first to correctly identify the work, Elisabeth Lutyen's Trio, Op. 135 for clarinet, cello and piano. Listen to the excerpt. NOVEMBER 2011: Deborah Hayes of Boulder, Colorado was the first to correctly identify the work, Jennifer Higdon's City Scape. Listen to the excerpt. OCTOBER 2011: Dafina Zeqiri of Prishtina, Kosovo was the first to correctly identify the work, Barbara Strozzi's Pensaci ben mio core. Listen to the excerpt. SEPTEMBER 2011: No one guessed the work, Libby Larsen's Deep Summer. Listen to the excerpt. AUGUST 2011: Deborah Hayes of Boulder, Colorado, was the first to correctly identify Amy Marcy Cheney Beach's Violin-Piano Sonata in A Minor. Listen to the excerpt. JULY 2011: In recognition of her many many correct answers over a period of several years  her first one was in MARCH '08  July 2011 has been designated Deborah Hayes Month in honor of her knowledge, detective skills, perseverance, and love-of-the-game. 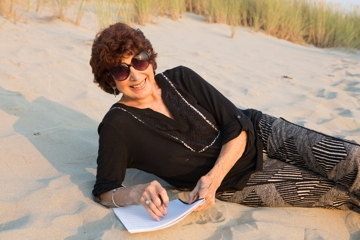 6/01/11: Deborah Hayes of Boulder, Colorado, was the first to correctly identify Ellen Taaffe Zwilich's Celebration. Listen to the excerpt. 5/01/11: No one guessed the work, Nancy Galbraith's String Quartet #3. Listen to the excerpt. 4/01/11: Deborah Hayes of Boulder, Colorado, was the first to correctly identify Sylvia Glickman's Krystalgade Synagogue. Listen to the excerpt. 3/01/11: No one guessed the work, Adrienne Albert's Boundaries for String Quintet. Listen to the excerpt. 2/01/11: IAWM President, Dr. Hsiao-Lan Wang, currently teaching at Montana State Unviersity, was the first to correctly identify Cécile Chaminade's Love Held Captive. Listen to the excerpt. 1/01/11: No one guessed the work, Anna Amalia, Duchess of Saxe-Weimar's Concerto for 12 Instruments and Cembalo Obbligato. Listen to the excerpt. Entrants are only eligible to win a quiz once every six months. Composers are not eligible to win any quiz of which their own composition is the subject!